No generic benchmark can exactly repeat a workload on your site. However, I went ahead and decided to test the performance of Performance Schema. In this post, we’ll look at Performance Schema benchmarks for OLTP Read/Write workloads. I am in love with Performance Schema and talk a lot about it. Performance Schema is a MySQL troubleshooting instrument. Earlier versions had performance issues. Many of these issues are fixed now and the default options work quickly and reliably. However, there is no free lunch! It is expected that the more instruments you turn ON, the more overhead you’ll have. The advice I give my customers is that when in doubt, only turn on the instruments that are required to troubleshoot your issue. Many of them ask, "What exactly are the overhead costs for one instrumentation or another?" I believe the best answer is, "Test on your system!" No generic benchmark can exactly repeat a workload on your site. 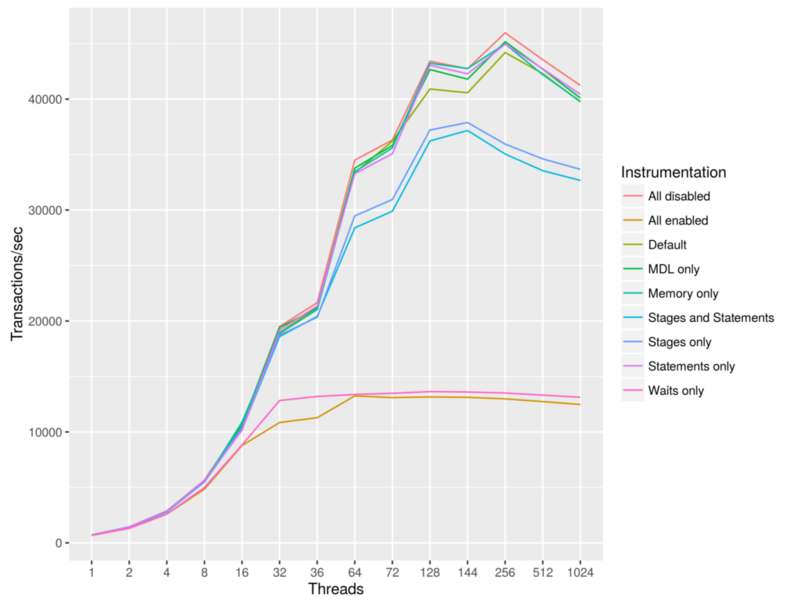 However, while I was working on the OpenSource Databases on Big Machines project, I decided to test the performance of Performance Schema as well. I only tested a Read/Write workload. I used the same fast machine (144 CPU cores), the same MySQL options and the same SysBench commands that I described in this post. The option innodb_flush_method was changed to O_DIRECT, because it’s more reasonable for real-life workloads. I also upgraded the MySQL Server version to Oracle’s MySQL 5.7.17. The reason for the upgrade was to test if the issue described in this post is repeatable with latest Oracle MySQL server version. 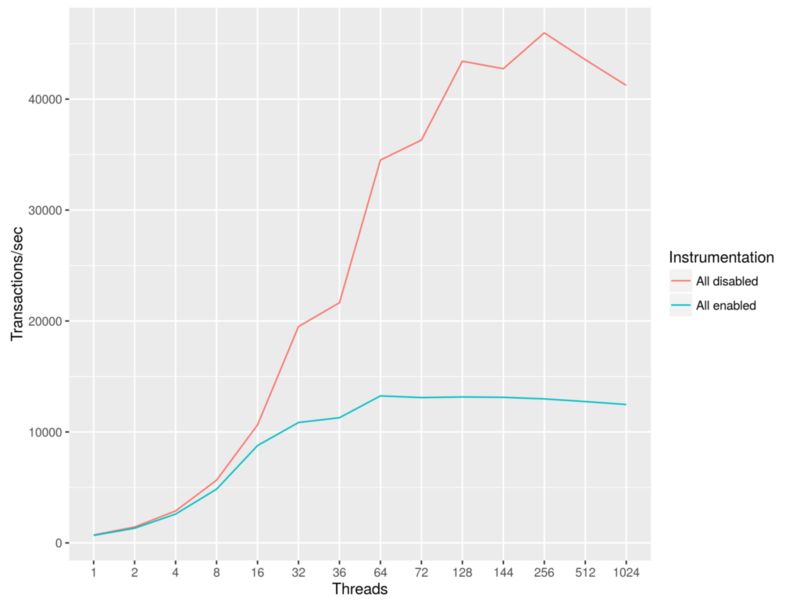 However, since I tested Performance Schema, the effect on Percona Server for MySQL should be same. I tested nine different scenarios. All disabled. Performance Schema is on, but all instruments and consumers are disabled. All enabled. Performance Schema is on and all instruments and consumers are enabled. Default. Performance Schema is on and only default instruments and consumers are enabled. “MDL only”: only Metadata Lock instrumentation is enabled. Memory only. Only Memory instrumentation enabled. Stages and statements. Only Stages and Statements instrumentation enabled. Stages only. Only Stages instrumentation enabled. Statements only. Only Statements instrumentation enabled. Waits only. Only Waits instrumentation enabled. As you can see, some instrumentation only slightly affects performance, while others affect it a lot. I created separate graphs to make the picture clearer. Regarding statements, I should note that I used prepared statements (which are instrumented in version 5.7). However, it makes sense to repeat the tests without prepared statements. 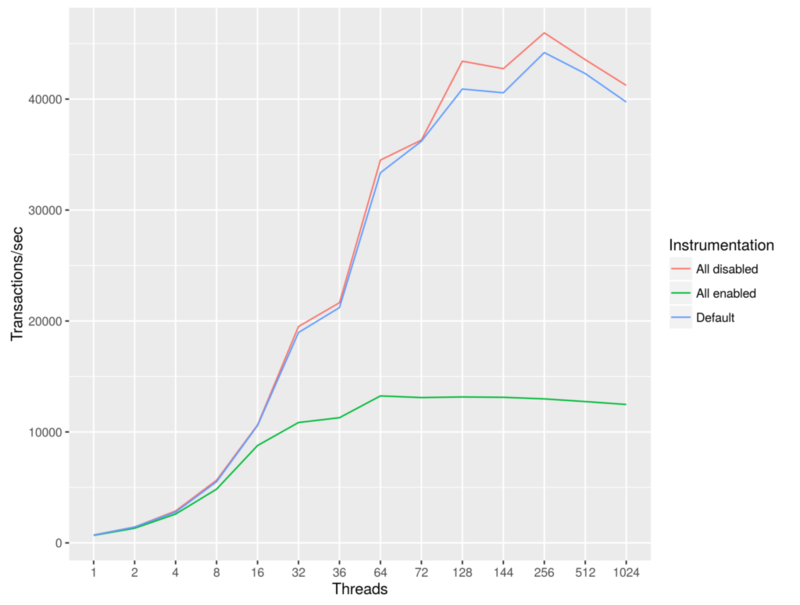 However, the slowdown is reasonable and it happens only after we reach 32 concurrent threads. 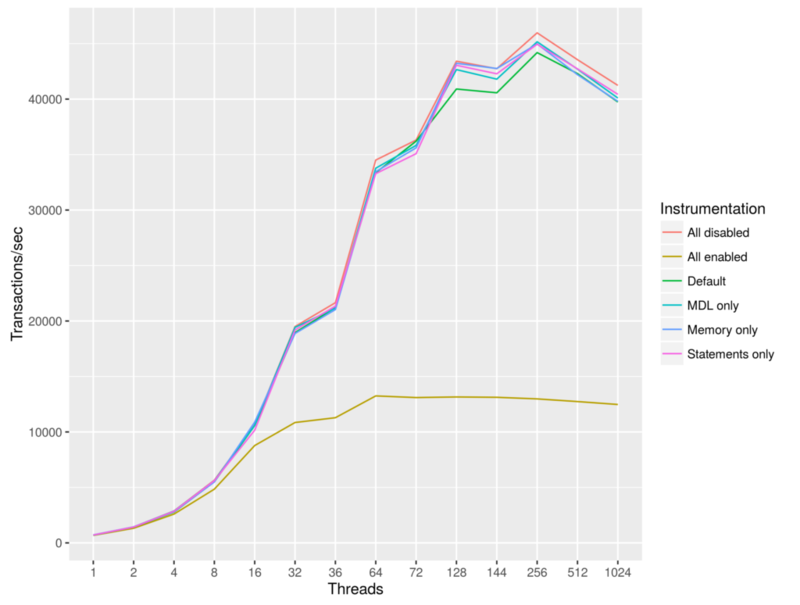 It still provides great insights on what is happening during query execution. It affects performance close to the same way as all instruments on. Using Performance Schema with the default options, Memory, Metadata Locks, and Statements instrumentation doesn’t have a great impact on read-write workload performance. You might notice slowdowns with Stages instrumentation after reaching 32 actively running parallel connections. The real performance killer is Waits instrumentation. Even with it on, you will start to notice a performance drop only after 10,000 transactions per second.